If you're here looking for this week's Hodgepodge questions, you'll find them here. And now for the rest of the story. Weekend. Wedding dress tale. If you missed the part where I almost told the story but then left you hanging, you can read that here. So, the dress. I mean The Dress. A wedding dress should have capital letters don't you think? 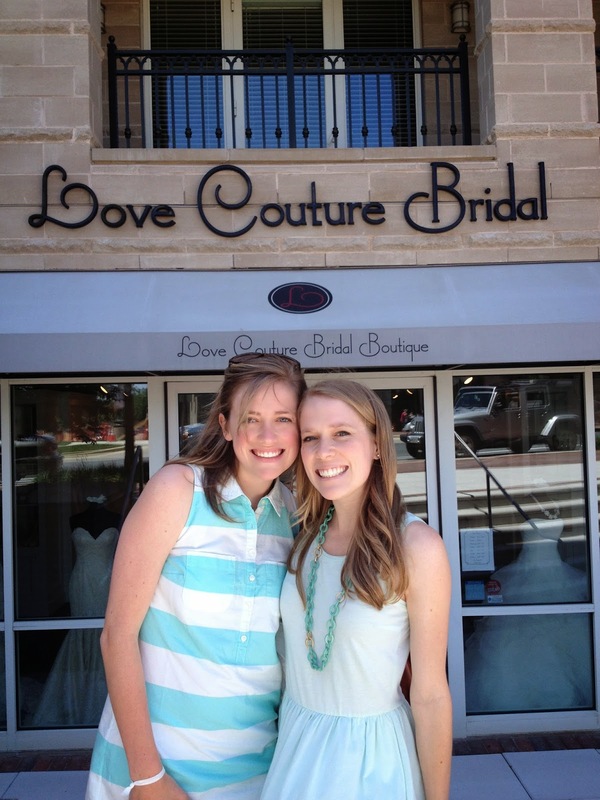 A lot of expectation goes into a planned day of wedding dress shopping. To be honest I was prepared for a little bit of anxiety/tears/snippy snip snips because a. I'd been up traversing the nether regions of D.C. until 1:30 in the morning, and b. girls and their clothes. My daughters are sweet as pie by the way, but girls and shopping and mothers and opinions...well, sometimes those things collide in cataclysmic ways. And sometimes they roll into each other with such perfection that you have to think hard to remember a day that was better than Saturday. Right now I honestly can't. In spite of the ridiculous amount of sleep we didn't get, we all woke up feeling cheerful. We had a 10 am appointment at a bridal salon so off we went, no coffee and a bag of pretzels in hand, which I have to say made for a less than stellar beginning, but still...it's DRESS DAY! The sun was shining, and a gentle breeze was blowing, and it was like God smiled on us all the day long. Daughter1's roommate is getting married this summer, and she bought her dress in this particular shop, so we were hoping for the same consultant. Daughter1 thought she was so sweet and liked her manner. Sure enough, she was ours, and she was a gem. She spoke directly to the bride first, but also asked what I had in mind. Mostly I explained that Daughter1 always cares a lot about my happiness, and today I would like her to get the dress she wants. Barring something scandalous in design or price, I wanted to hear Daughter1's opinion before I weighed in with my own. Shopping this particular weekend was a bit of a last minute plan decided upon after looking at my too-full June calendar. Flying Daughter2 in was definitely last minute, and worth every single solitary cent it cost. My girlies have dreamed about this since forever, and it was important to have her there to share in the looking and deciding, the reassuring and all the oohing and ahhing. Plus I needed someone sitting close beside me as I braced for what was coming, and she's used to me. I guess nothing completely prepares you for the sight of your daughter in a wedding dress, but there she is. It's the first dress that does you in, at least for me it was. That's not even the dress we bought, but it doesn't matter. In that moment you accept the reality of the little girl in your head standing on a dais before a three way mirror. She's smiling at herself in a wedding gown like a full grown woman, and your heart beats a little too fast or maybe not fast enough. You take a picture in your head because you know you'll want to return to it again and again and again. When Daughter1 waltzed out in dress number four, I knew. I knew because in that dress I recognized her, my girl. The bride. The daughter I birthed who loves music and art and words and Jesus, not in that order. The girl who can make me smile when I want to cry and cry because she makes me smile. We go to lunch anyway, and we talk and everyone exhales, and we know. We cancel our later appointment in the city and we go back in and buy that dress. The consultant didn't try to press us, but one thing she said stuck with me. She said in her experience, when a bride doesn't want to take off a dress, then that's usually her dress. And she was right. So glad you found The One and had so much fun doing it! I'll bet Daughter 2 is paying close attention to how everything is done! So glad that the whole Dress experience was so pleasurable for you all. I'm sure she'll be a beautiful bride in a beautiful dress. Wow! I guess when you know it's right, it's right! So glad she found the dress of her dreams! Oh, my goodness, this brings back so many memories for me and my daughter and I shopping for "her dress." It was such a magical time and like you, when she came out in the very first dress, my heart literally skipped a beat. So glad that the three of you could share in this special memory together, even with little sleep. Oh how I am enjoying living this experience with you! It brings back such wonderful, wonderful memories of my own daughters day. Trust me, you will re-live and re-tell and cherish every minute of yours to for years to come. At least I have anyway. Having THE dress is a big item checked off the lengthly list of details and I am glad your experience was a good one! I am so excited for you and your family. What a great day and dress #4 was it. I'm pretty sure that doesn't happen unless God's in it. With having three boys, its so much fun to follow this through the eyes of a mother and daughter. :) Have fun with all the planning and preparation! What a beautiful story...I'm the mom of Son's so this was so exciting for me to experience :-) Love your blog especially Tuesdays when I can pick up questions for Wednesday! What special memories you will now have forever. I just got goosebumps. For real. What an awesome time you all had, and now she has THE DRESS!!! I know we have to wait to see it. I'm looking forward to it, though, and the anticipation will be fun. So much fun! I'm so glad you and Daughter2 got to be a part of this special time. And you're right--when they step out in that first dress, it takes your breath away! This was such a sweet post and made me miss my daughters all over again. They're too far away. So glad she found the right dress. Oh, Joyce, I felt like I was right there with you as I read this. I can picture a road-weary, coffee-less me munching on pretzels but being fueled by adrenaline and love. I'm so happy she found THE dress on your first appointment. I can picture her twirling and not wanting to take the dress off because she just feels like we all did when we tried on the one and only dress for us. Looking forward to more special mother-daughter stories as you plan for the big day. You had me smiling from just imagining the joy of seeing and knowing that beautiful bride-to-be is still your little girl in that happy adult being standing in front of you. I just can't wait to see the wedding pictures when that time comes. In the mean time, I look forward to taking more steps with you toward that important day. Such a beautiful story!!! I cannot wait to see the dress!!!! Such a sweet, sweet, time! Both your girls are beAutiful - just like you. Love the photo! She's gonna be a beautiful Bride! The Dress my daughter chose was the only dress I cried when she walked out with in on. She looked beautiful in everything, but that Dress did me in. Glad it was so easy for you all. I can't imagine seeing my girls in a wedding dress! Happy Days! I'm going through this exact thing right now with my Daughter1 and you've put into words everything I've been feeling! So happy your daughter found her dress.